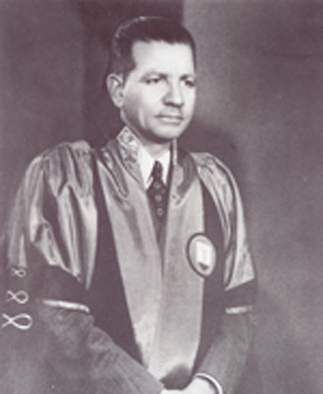 – Work as Dean of the College from 27/9/1956 to 26/9/1960. – Received a Bachelor degree in Medicine and Surgery in 1931. – Worked as clinical assistant in el Qasr Al Aini hospital in Cairo for one year. – Worked as a privilege doctor in el Qasr Al Aini hospital in Cairo for one year. -Worked as a Professor in the Public Health Department and Preventive Medicine , at the same time he served as director of the Nutrition Department in ministry of health. – Worked as nutrition expert in the United Nations from 1946 to December 1951. – He came to Alexandria and worked as professor in Public Health Department in 1942. – After the end of his duty as Dean, he was hired as dean in the High Institute of Public Health in 1960 and stayed there tilL he reached his retirement age in 1968. -He has been able to mobilize college and hospitals to the higher level of emergency at the time of tripartite aggression against Egypt in 1956. During his reign, they started establishing sector (d)in the big building for surgery and internal medicine sections, to be occupied by the specialized such as radiology and ophthalmology, neurosurgery, urology. we benefited from his work as nutrition expert in World Health Organization to start a new stage of close cooperation between the college and the Organization, which helped on sending missions and on financing the college with some equipments.